This article was written by John Daggett. John is a Mozilla contributor and has been working hard with font creators and web developers to improve the state of fonts on the web. This article is a high-level overview of whats different and shows some examples of WOFF in use. A full list of other supporting organizations can be found at the official Mozilla Blog. In Firefox 3.5 we included support for linking to TrueType and OpenType fonts. In Firefox 3.6 we’re including support for a new font format – the Web Open Font Format, or WOFF. This format has two main advantages over raw TrueType or OpenType fonts. It is compressed, which means that you will typically see much smaller download sizes compared with raw TrueType or OpenType fonts. It contains information that allows you to see where the font came from – without DRM or labeling for a specific domain – which means it has support from a large number of font creators and font foundries. The WOFF format originated from a collabaration between the font designers Erik van Blokland and Tal Leming with help from Mozilla’s Jonathan Kew. Each had proposed their own format and WOFF represents a melding of these different proposals. The format itself is intended to be a simple repackaging of OpenType or TrueType font data, it doesn’t introduce any new behavior, alter the @font-face linking mechanism or affect the way fonts are rendered. Many font vendors have expressed support for this new format so the hope is this will open up a wider range of font options for web designers. First, compression is part of the WOFF format so web authors can optimize the size of fonts used on their pages. The compression format is lossless, the uncompressed font data will match that of the original OpenType or TrueType font, so the way the font renders will be the same as the original. Similar compression can be achieved using general HTTP compression but because compression is part of the WOFF format, it’s simpler for authors to use, especially in situations where access to server configuration is not possible. Second, the format includes optional metadata so that a font vendor can tag their fonts with information related to font usage. This metadata doesn’t affect how fonts are loaded but tools can use this information to identify the source of a given font, so that those interested in the design of a given page can track down the fonts used on that page. Fonts in WOFF format are compressed but are not encrypted, the format should not be viewed as a “secure” format by those looking for a mechanism to strictly regulate and control font use. Note: until Firefox 3.6 ships, users can test the use of WOFF fonts with Firefox nightly builds. Structured this way, browsers that support the WOFF format will download the WOFF file. Other browsers that support @font-face but don’t yet support the WOFF format will use the TrueType version. (Note: IE support is a bit trickier, as discussed below). 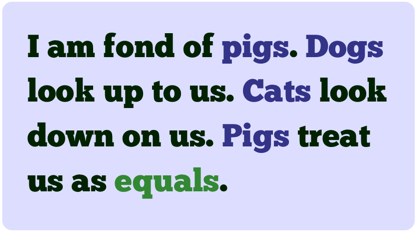 As WOFF is adopted more widely the need to include links to multiple font formats will diminish. Other examples below demostrate the use of WOFF formatted fonts but each example has been constructed so that it will work in any browser that supports @font-face, including Internet Explorer. Below is an example of how downloadable fonts can be used to render languages for which font support is usually lacking. 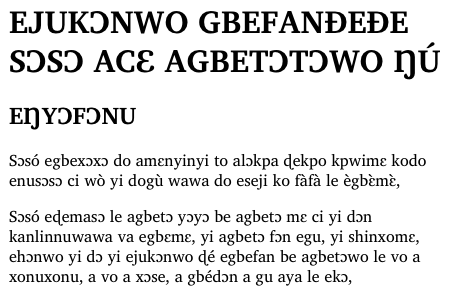 The example shows the UN Declaration of Human Rights, translated into two African languages, and how these render with default browser fonts vs. with a downloadable font suited for rendering these languages. Note that in one of these examples that the font size goes from a 3.1MB TTF to a 1MB WOFF font and in the other from a 172KB TTF to an 80KB WOFF file. Firefox 3.6 will be the first shipping browser to support the WOFF format so it’s important to construct @font-face rules that work with browsers lacking WOFF support. One thing that helps greatly with this is the use of format hints to indicate the format of font data before it’s downloaded; browsers that don’t recognize a given format simply skip data in a format they don’t support. IE successfully pulls down and uses the EOT version of the font but also tries to pull down the WOFF font with the format hint included in the URL. This fails and doesn’t affecting page rendering but it wastes valuable server resources. For more discussion, see Paul Irish’s blog post for one interesting workaround. Another problem is that IE currently tries to download all fonts on the page, whether they are used or not. That makes site-wide stylesheets containing all fonts used on site pages difficult, since IE will always try to download all fonts defined in @font-face rules, wasting lots of server bandwidth. Using the mentioned Firefox nightly builds you can see what WOFF could look like on a sample page FSI FontShop International designed together with the guys from Edenspiekermann using both FF Meta and FF Meta Serif to endorse the WOFF specification: edenspiekermann.com/woff. Then you’d be able to reduce the CSS syntax back to the first example. Fantastic, thanks for your support! Yes, but if you edited that list you would quietly break the link to the EOT font. So it’s possible but somewhat brittle in practice. Thanks for supporting the foundries, John. For those who don’t have the latest Firefox build installed [probably the bigger part of your readers], here you can find a screenshot, which shows the beautiness of typographic diversity on the web. Congrats to all on a job elegantly done. Among font vendors it would seem you’ve gone from being the Devil incarnate to Saint John the Divine. And in the space of less than a year. Thanks. Much of the work for this was done by Tal, Erik and Jonathan, they deserve the credit for bringing this to fruition. Lots of devilish work ahead. More tomorrow. For fonts with a large number of glyphs, it is important to have random access to glyph data, so that you don’t spend the time and memory reading in, say, the 32,000 glyphs of a CJK font of which you only use 100. The Deflate compression is stream based, so if you kept the glyph data compressed and read each glyph as needed, as is common and efficient practice with TrueType and OpenType fonts, then on average you would have to decompress half of the glyph data for each glyph. What is the recommended or Mozilla way to handle fonts with large glyph data that is compressed internally? Why no EOT support? Doesn’t that mean that cross-browser font support will be a pipe-dream for the foreseeable future (until IE6, IE7 AND IE8 dies, let alone the other browsers catching up)? What sort of file format is WOFF? Are Google/Opera/Apple/Microsoft all happy with WOFF, or is it Mozilla proprietary? Does it require dedicated tools or can it be made by hand? Has a spec been published anywhere? Is Mozilla planning making the tools to allow people to convert to and from other font formats? Are the font foundries signed up? What about the font software manufacturers? Great work, will make it a lot easier to use downloadable fonts and not running into problems with making font files available on a public web server. The resources section contains links to the spec and sample code. You can read more of the background discussion of the format on the www-font mailing list. Right now the format is relatively simple, tables are either compressed or not, there’s no way to do partial decompression on a given table. CJK fonts are an interesting example, you probably don’t want to send 32,000 glyphs in any form, compressed or not. A format for the future would be one that allowed separate chunks containing sets of glyphs to be downloaded and dynamically linked to the original font when needed. But that’s a very, very tricky problem. Another approach would be to consider a stroke-based format, taking advantage of the common elements in CJK glyphs. But I don’t know of any open format for stroke-based glyphs. No mentioning of svg fonts is kind of a drawback. Open and TrueType fonts all good but svgfonts provide a step forward because they’re vector based. Why doesn’t Firefox support svgfonts, they exist for a while and Opera 10 supports them. Followed a link on Lifehacker.com here…why is it that BROWSER DESIGNERS can’t design a website with FLUID WIDTH PAGES? I’ve got a 1680×1050 screen, and the main body of the site barely takes up 50% of the width of my screen. Get a clue, designers! does WOFF support RTL ? I don’t think that these downloadable fonts are usable in a website design context. The fact that you can see the text change fonts at each page load is painful to the eyes. No conversion tools yet? What is fontsquirrel using for the online converter? Besides being an informative post, it’s great to see citations from the UDHR! As far as fonts supporting Unicode, I made a request at https://bugzilla.mozilla.org/show_bug.cgi?id=512619 for Mozilla to consider hosting some very basic (and free) fonts on a server which could be automatically retrieved and cached whenever Unicode characters were encountered but not supported in one’s default font support (and where font-face wasn’t specified). Rather than put the burden on developers (and avoid a potential single point of failure for their users), how about facilitating the download of basic fonts covering all specified Unicode code points for all users (without interfering with the ability for sites to cause custom fonts to be downloaded)? This way, the dream of Unicode–for any human script to be practically viewed along with any others without extra hurdles–could really be realized. Why not support EOT ? This is effectivly OpenType but in optimised form (contains OT subsets thus smaller files). Much more effective for webpages than opentype and truetype itself and already in use on the internet for 10 years. Won’t we see spammers use this feature to create spam messages that are undetectable automatically (unless using OCR or using stats on use of characters..): If I create a web font that inverts characters (‘e’ being actually shown as ‘p’ by the font): the content will look like binary data/gibberish but when displayed it will actually read as a spam message trying to sell you some medication. I can see at least http proxy filters being fooled by this system for instance, maybe even emails if your client supports this. Any thoughts on ways to prevent this from happening (if it hasn’t already)? These fonts are only usable on the domain where they are stored. AFAIK they cannot be used in an e-mail unless it directs you back to their site. You can’t download a font from a different domain at this point for your webpages, you have to host the font. I believe some version of this has been discussed before, so it is not a new idea as far as I know, but to someone like me it seems to be a good idea, and it would be interesting to know your thoughts on this. Anyway, the idea is to require the user to have ANY UTF-8 font available on their system and let CSS tell the browers SVG-renderer to draw a font that looks like Times, Helvetica or whatever. If this is possible, the user only needs ONE font installed and browsers styles it into whatever the designer wants it to look like. If the browser has seen this styling before it could cache it to render faster the next time round. Is this a horrible idea? There is an important need about about the fonts and that is the progressive downloads instead of complete downloads. I mean that the web fonts should behave in the similar way as it is for the PDF documents. If you are using a ligature based font whose size TTF file is about 20+MB, then only a subset of the font is included instead of whole font being bundled. But in case of web fonts, we are downloading the whole font over HTTP which I think is a little in efficient. I do not see why it cannot be done to partially download the parts of the fonts that are really needed. Anew views on this? Looking to integrate WOFF with a GWT application. Please suggest how I should proceed. I like very much this solfware. How convert .woff file formate????? You can use this service http://orionevent.comxa.com/otf2woff.html and have a look at http://html5demo.braincracking.org/demo/woff.php to see how to use it. The idea is to require the user to have ANY UTF-8 font available on their system and let CSS tell the browers SVG-renderer to draw a font that looks like Times!! I made this page http://html5demo.braincracking.org/demo/woff.php to test WOFF support, but I don’t understand why it doesn’t work on latest version of Firefox and Chrome ? Why query: @font-face has no effect on the print preview in Mozilla Firefox? Whereas in Google Chrome it be? There are some good open source font foundries out there. The ones I like are Font squirrel, the League of movable type and Unicode Font. Unfortunately most of the fonts available from these foundries are not yet available in WOFF packages, so what can I do?